We brew beer with real New Hampshire spirit of independence, home town pride, and hard work. Our goal is pretty simple: to bring people together, to celebrate this quirky little town we live in, and to make a living doing something we care about. Using only the finest ingredients, we craft all of our beers by hand and stake our reputation on every glass it goes into. We wouldn't have it any other way. So go ahead, pour yourself a glass! We promise you'll be coming back for more. Cheers! This is a no-see-through, wealthy-rich looking-in-the-glass dark porter. A velvety rich toasted malt aroma and flavor with a balanced foundation of roast malt character to boot. Smooth hop-malt/bitter-sweet balance in flavor. Impact of aftertaste is evident but not everlasting, forcing you to continue working on this glass of truly well-made porter. Worthy of being a classic. Love that currently brewers are breaking away and embracing classic styles, staying true to them, and doing them really well. At the same time still chugging along with the rest of the portfolio. Big on crispness, mild breadiness, maltiness is there but very clean. Perfect amount of hopping, subtle bitterness cleans the palate. This beer is pretty damn special. Many of our favorite kolsches in this tasting were ones that featured a modicum of noble hops, splitting the difference between the likes of pilsner, helles and kolsch. 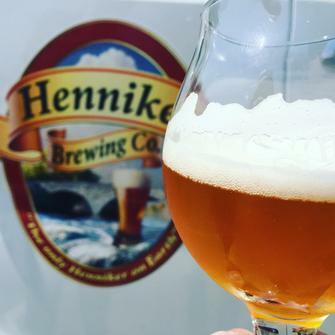 Henniker’s simply named kolsch fits all of those qualifications, featuring a nicely floral note on a crisp malt body, followed by a lingering note of spicy Saaz, like you’d expect to find in a classical Czech pils, but not as assertive. In a sense, it’s sort of what kolsch is all about—a welcoming middle ground between styles that are more focused on specific, more intense flavor notes. Henniker’s is balanced and easy drinking, but with character to spare. That’s the kind of description you want in a kolsch, to be sure. The upfront coffee blast is tremendous; coffee lovers rejoice. Rich and malty, this brew is extremely well-balanced and smooth. A perfect wintertime stout. I wouldn’t complain if Henniker Brewing Co. made this a year-round offering.